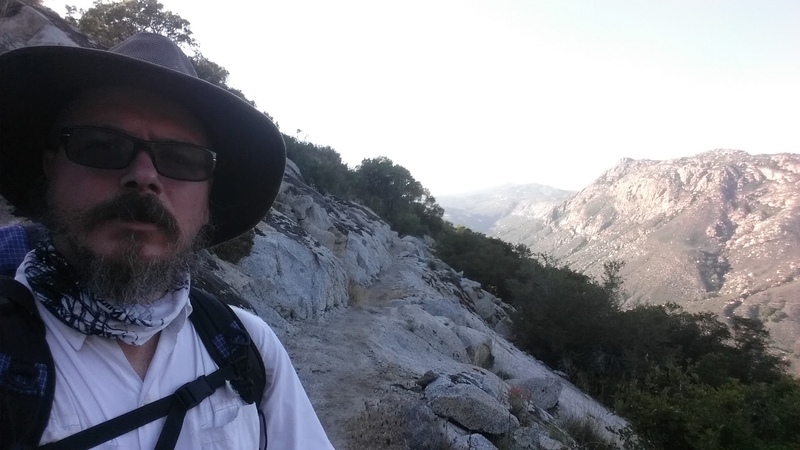 I got out of my tent at 6 am, packed up and started up the side of the canyon that Hauser creek is in. The way is steep and in full sun it is brutal. Billy Goat and his friends on the trolly warned me about it. In the morning before the sun reaches that side of the canyon the hike was pleasant. A lot of birds were out and I only saw a couple other hikers. I did notice an area disturbed about four miles in. I would find out later that a 19 year old aspiring thru-hiker had died there the previous day. He had shown up at the creek and bragged that had only drank one liter of water and then made the climb out in the full afternoon sun, at the top he started to get the signs of heat exhaustion and called his father who then called search and rescue, they were too late. In around the same area that day I saw two dead baby gophers. 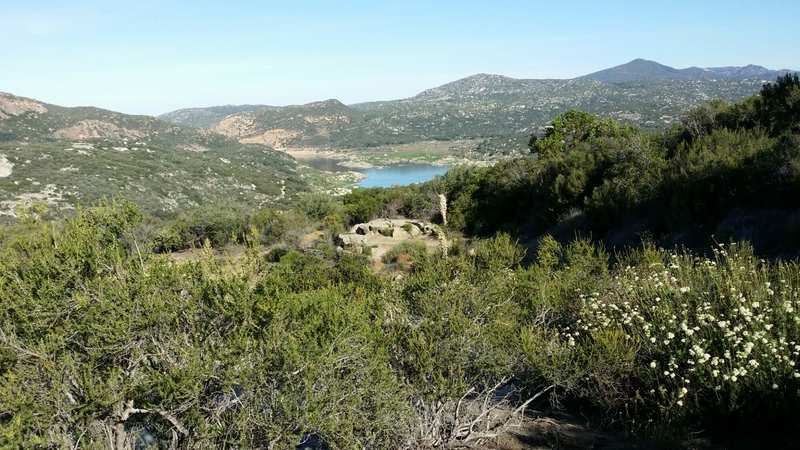 The hike down from the top to lake Morena was great, I could hear the low rumble of the 1,000+ people below as I walked down, click – clacking my poles as I went. I was still sore from the day before and as I came into the ADZPCTKO a motherly looking woman said, I was the first in for the day and said “you need a hug” which I thought about and said, “you know, you are right” so I got a hug on my way in and went to get registered. After getting registered and picking up my hiker flag I made my to my camping spot and set up. 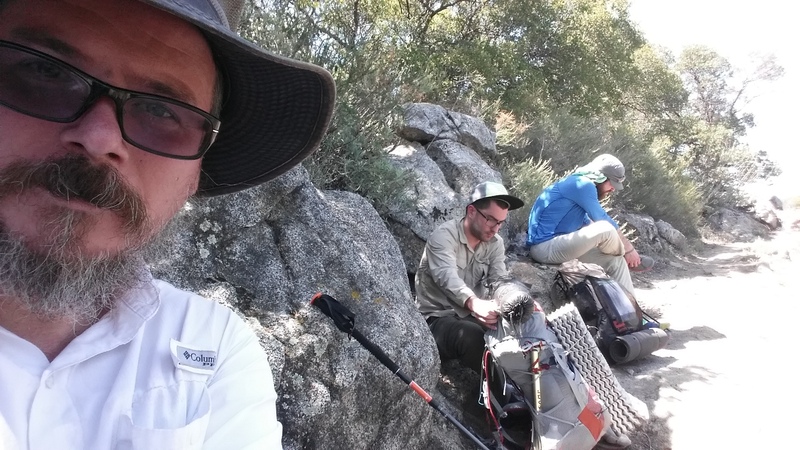 I then set up to make more coffee and some lunch when I see Adrien walking in, it turns out my hiking partners, so far, stopped in Hauser creek before me and chose to cowboy camp (not setting up a tent) a little further back where it was flatter and I had not seen them. I ended up ahead of them. 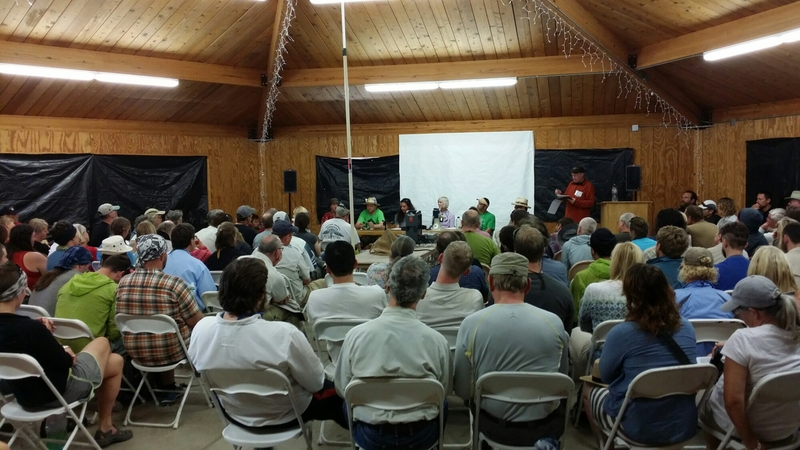 Then we all caught up, went to the desert hiking panel and got lunch at the little store down the street, then got in late to the water report, which for us is critical as there are sections right now without water for 35 miles. That is kind of scary given my experience on day one. 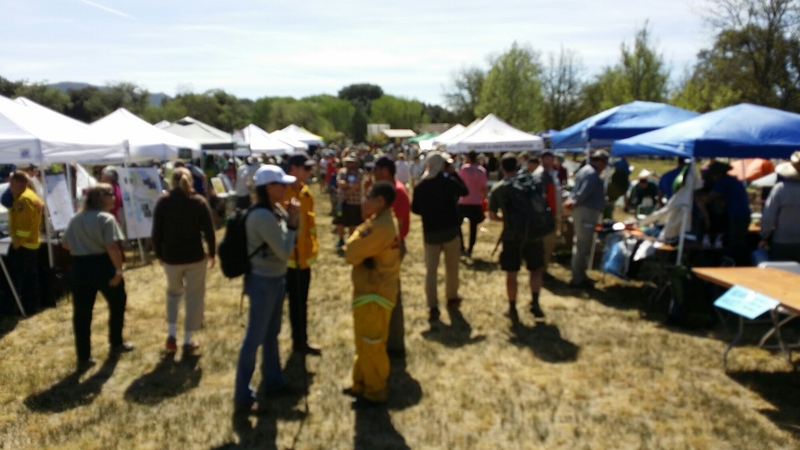 There is a large assortment of the top ultralight vendors at kickoff and I got to examine firsthand all kinds of packs and gear. I decided I wanted good sleep so I picked up an ultralight inflatable pad that has its own little inflator squeeze thing, the salesman was hyper and jumping up and down on the pads to show how they are tough. It is 10.5 ounces and feels better than the pad I was using, we will see. The kickoff feeds thru-hikers and on Friday night it was burritos, I found that adding seasoning salt to a burrito makes it awesome. There are rumors of rain for the evening, this is welcome considering the water report. As evening settled I left the large group of hikers I was hanging with and went to my tent to sleep on my new awesome pad. The tent neighbors were still up sipping beers and talking but that was okay I was going to get sleep, I knew the rain would start and they would quiet, it did. At first it was little pings of rain, bouncing off my tent, then more, and then the wind started. 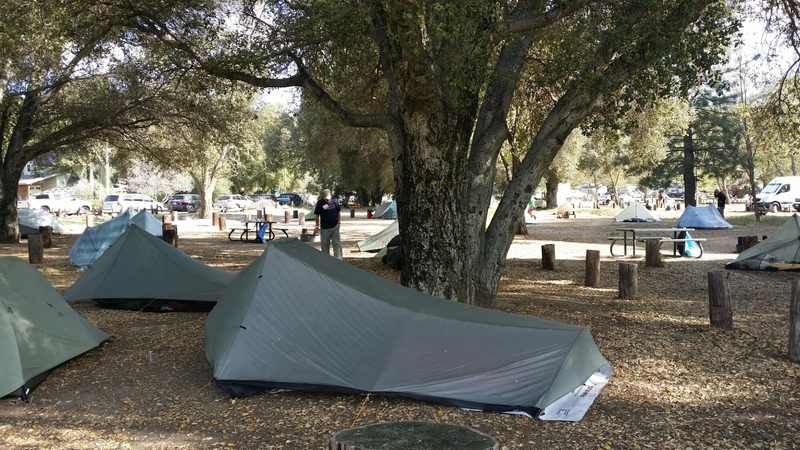 I noticed my tent seemed not as taut as it should be, but my stakes were holding so I tried to sleep, but then my stakes flew up and one crazy night began, I saw many other lights come on all over the campground. This entry was posted in Uncategorized on April 26, 2014 by joeldg. Let me start by saying my nerves messed up my sleep for a couple nights before the start of my hike. So, I had very little sleep going into San Diego and then got to El Cajon and got into my little hotel the Relax Inn which is next to the transit station and has a Denny’s convieniently next to it. It also has an AM/PM and a 7/11 next to it which came in handy for snagging a beer later, which of course I was thinking would be my last chance for one. Waking, my nerves were on high to get to the bus on time and not forget anything that I didn’t eat. I got to the transit station and was the only hiker there, then a couple and their little dog from BC came in and then two chain smoking guys from Israel came along and then Adrien from Spain. We boarded up after some confusion about ticket machines andjust as we were pulling away Ray from Boston jumped on the bus. The bus ride had a lot of locals who were shopping and going back to Tecate, it wound through the mountains and after Tecate only hikers were on the bus. We arrived at campo and are sumarily dropped off and given a ‘good luck’ by the bus driver and that was that. 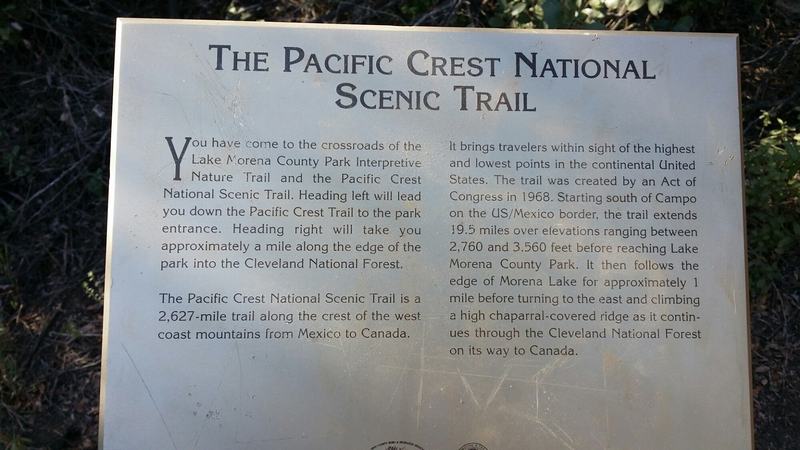 From the bus stop we hiked a mile in to the border and the monument, it is a small thing, not a ‘proper’ monument, it is more a milepost marker that is sort of rotten and dangerous now to climb on. We all signed the register on the back side of the monument and took our obligatory ‘start’ photos in which we look dorky and fresh and entirely unprepared for what is coming next. Me at the monument looking fresh with Ray in the back signing the register. Like all thru-hikers before us we started going too fast. You get there, you are at the monument and you just want to get hiking and you want to get to your first view, your first lizard, your first camp and water source. It is natural and you risk injury. We got about five miles in and I realized in my zeal to get going, I got my gaiters on but I forgot my liner socks. Liner socks are important, they help ease foot friction which eases blistering. I started getting hot spots on my feet and stopped, aired my feet and then realized my mistake. Not a good mistake the first day. Then, after a bit I was on again and realized my second mistake. I not only forgot to eat, I forgot to take a vitamin or anything, and I just sort of ran out of steam tromping up the side of a mountain. It was then I fell back and let my hiking partners go on and decided I needed to stop and chill for a while, I ate a bar and took a vitamin and an ibuprofen. I took a nap for about thirty mins, refreshed I continued on. I passed a large woman who was picking at her feet, the following morning I would find out she was in trouble and the forest service was looking for her. 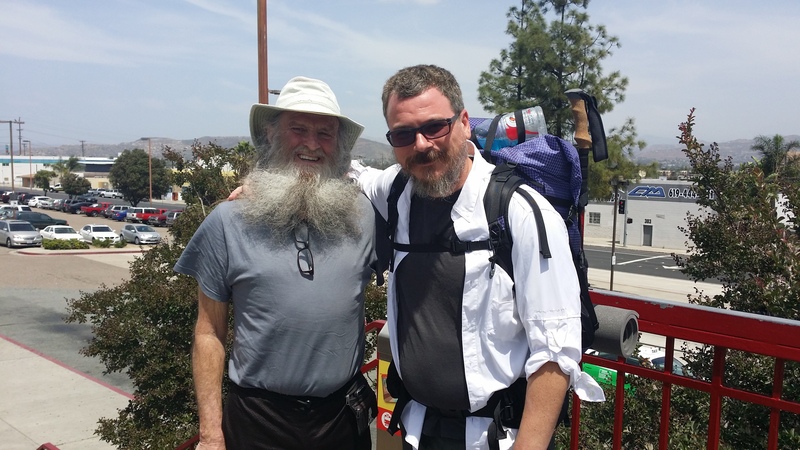 I then passed ‘plodder’ who is 73 and hiking the PCT, he was hurting and going pretty slow, he had a guy walking along with him to keep him company and most likely to keep an eye on him, I have not seen him since. The first day is rough. I trudged on, I was surprised at my strength and yet kind of freaked out by my weakness at the same time. It is hard to explain without putting a pack on you loaded down with water and food and walking with you up the side of a mountain. You can do it, but it hurts, it really hurts when you are not used to it. But the views were good. Finally I made my way into Hauser creek, mile 15.1 of the PCT and there was a water cache, water that is brought in by trail angels. I was really excited by this as I had a little less than two liters of water left. 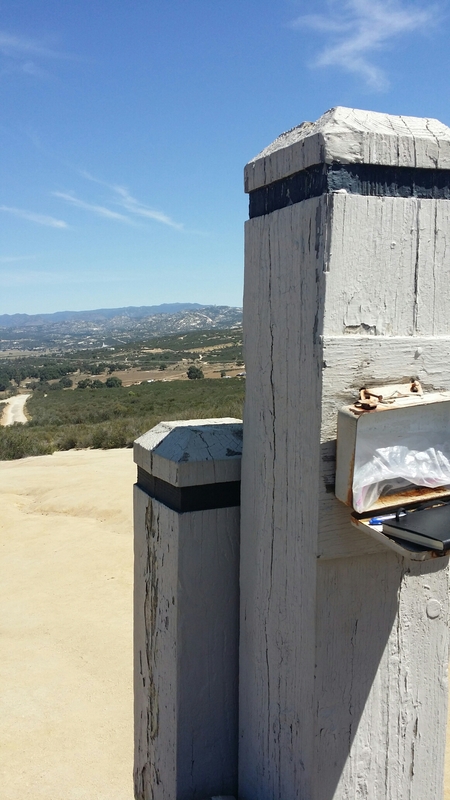 Looks like trash, but these water caches can save lives. 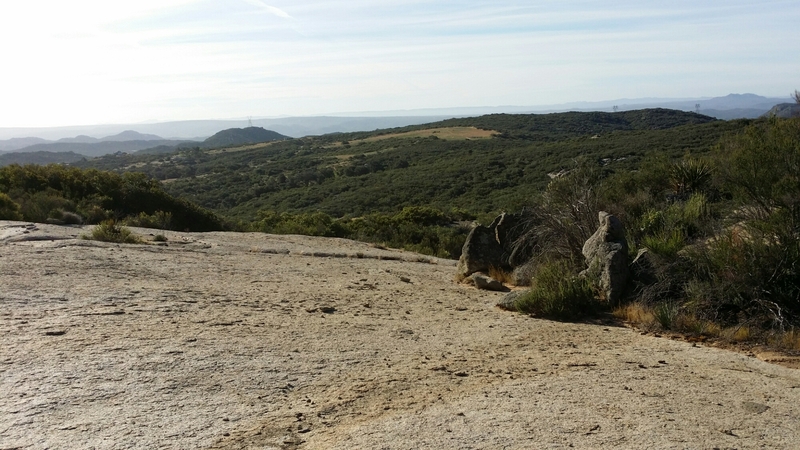 At this point I was painfully tired and dodging some poison oak I found a place to put my tent, not the best place, but a place. I layed down for a little while to catch my breath and just rest. After I felt better I boiled some water and had my dinner. Then as the sun was going down I got into my tent and zipped in and assumed I would sleep well. I was mistaken. In the border zone areas there are night patrols all the time. They have flights every twenty minutes or so through the canyons through the entire zone. They are equipped with infrared so they don’t have searchlights like the city airships I am used to, and they have a definitive military feel and sound to them. 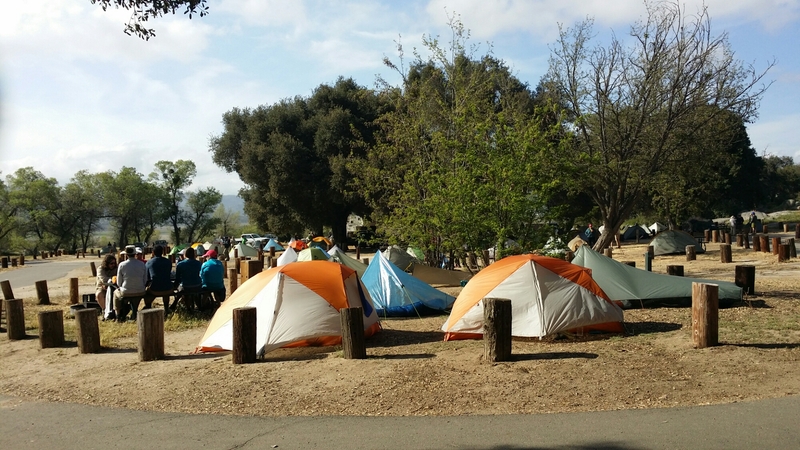 While this was going on, the people in tents around me were obviously not used to their sleeping systems so I got to heard them inflating their tents, fiddling around trying to get comfortable, turning on their lights on and off, getting water and going to the bathroom. Then I realized my third mistake of the day, in my rush to sleep I had set up my tent at an incline which means I would slowly slide to one side and end of my tent. My sleep was not good. Though, I did manage to sleep in spurts. This entry was posted in pct on April 26, 2014 by joeldg. Just a quick update, mostly for my sister Julie, I made it to San Diego, and then after running around I hopped on the trolly to El Cajon after running around in downtown for a while (I lived here when I was in the Navy so have some places I wanted to see). Next stop I noticed some hikers on the trolly and started to chat them up and then it turns out that Billy Goat is on trolly and we all talk all the way to the transit station. My sister mentioned in a comment here that she had hung out with him up in Stehekin and he remembered her. Tomorrow morning bright and early I will be on the trail, nice to already bump into some hikers. This entry was posted in Uncategorized on April 23, 2014 by joeldg. It is hard to go on living without some hope of encountering the extraordinary. Tomorrow I start my drive south to the border. All the work, the planning, the job-quitting, the apartment-vacating/moving, the stress and research, the car rentals and motels and saving money that could have been used in a myriad of ways. All these things have boiled down to one thing, and I start the final move in that direction at around noon tomorrow. I am thankful for this last week here in Oregon to figure out all that I need to do. I really needed to get here, finish up my resupply and then have nothing to do. I needed the quiet, the passive few days to rest for a minute. The quiet before the storm … so to speak. 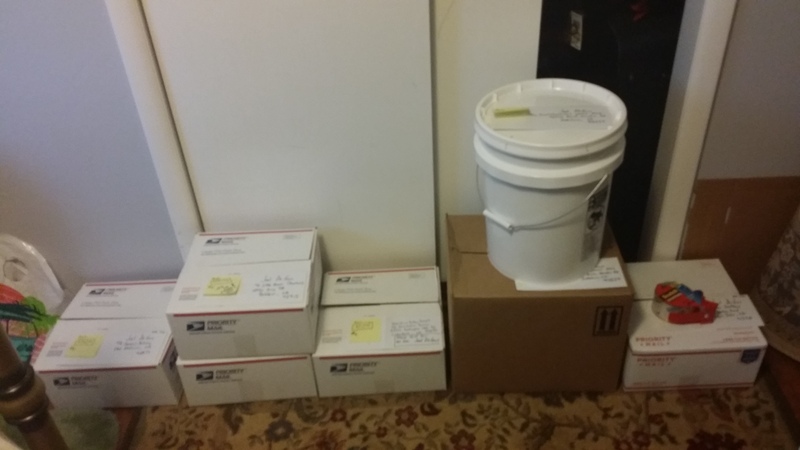 Here is what my California hybrid-resupply looks like. The bucket is my bounce bucket and the first time I will see it is at Kennedy Meadows.. The box below it is my bear vault and food for ten days. It also has a few other things and the bucket has some gear swaps I need to make. The others are for other places like old station and VVR where I need to mail packages. Here is my pack, fully loaded with food. It feels heavy even though I know that I have made every effort to lighten it up. Nothing left to do but make my way to the border and start, one more sleep. This entry was posted in babble, pct on April 20, 2014 by joeldg. Not a big one obviously, but a little one for my tent, it was given as a parting gift from friends at my going away, along with various other small sized Tabasco products and all the fire starting essentials one could ever need, a knife, some hot and sour soup, a light, a Venice button, a little squirt gun (for bears of course) etc. Yes, I do realize that this means my trail name is going to be ‘Disco’, oh well, it has to come as a memento of what I left. I managed to pack out the whole bar for my going away and it was awesome to see everyone. I took a few more shots than I meant to take but I had Saturday to do my much needed recovery. And it was a recovery day, I have not hurt that much after a night out in a long time. But it was worth it, a day of pain, to say goodbye to everyone and I am very thankful of my friends here, Venice has treated me so well I don’t even know where to begin saying my thanks. Today is it, I am getting coffee and then I need to go pick up the rental and start heading North for setting up resupply and visit with Family for a couple days before I go. On some level with this you think “What have I done?!? !” and you recoil. It is a feeling before a move, the feeling in your gut on the last day of high school, the last day of a great job, the feeling of standing in an empty apartment you lived in for years, now devoid of you. It is the feeling of a changing life, of crossing a bridge with no way back and not know what is on the other side. It is called butterflies in the stomach, queasiness, anxiety and fear. Bravery is continuing on in sprite of fear, not the absence of fear. On that measure I am either brave or reckless, I am not sure which, but I am at least on a path. Well, me and my little disco ball. This entry was posted in babble, pct on April 14, 2014 by joeldg. I get asked this a lot and even typed up a long post here explaining that I have a great life and love where I am, a job and skillset some people would kill for. I have everything I could ask for. Being happy is one thing but I want to be ‘more’ if that makes any sense. It isn’t greed for ‘more’ it is more like wanting more air, I need to breathe. 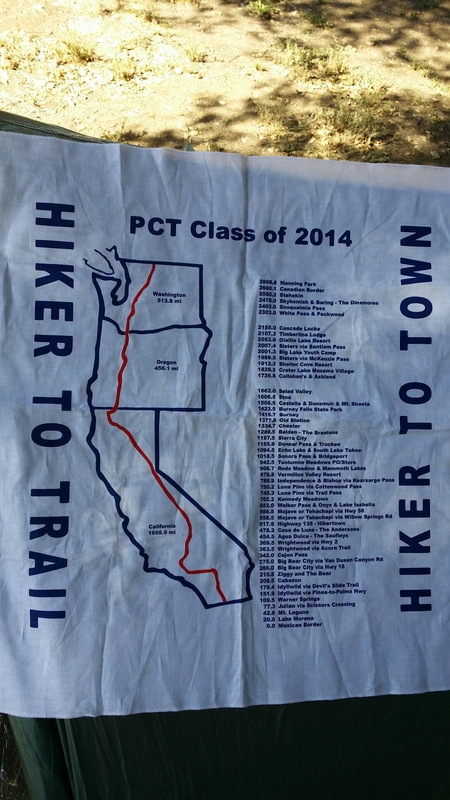 The post was actually really good but I deleted it because I didn’t feel like it was along the tone I want this story — the story of my PCT trip and beyond — to carry. I don’t want to be looking back, not at the start of moving forward. While researching on a possible trip down the Mississippi river on a stand up paddleboard (need to spend my time before I am hiking somehow) I ran across this dude and he didn’t answer the ‘why’ question directly but did so indirectly. Check him out and listen to what he is saying. This entry was posted in babble, pct on April 9, 2014 by joeldg. If you are doing the PCT soon (or even the AT or CDT) and don’t have a digital kitchen scale, I suggest you go right now down to the store and buy one. You can find them in any major grocery store in the baking aisle near the baking timers and graters etc. Get one that goes up to at least 11lbs (176oz), they should do both grams and ounces. It will cost about $20-$30 but I think it is worth it. Weight is really important to people who have to carry all their stuff for thousands of miles. Previously I was either going based on manufacturer listed weight, the weight that is stated on Amazon for the item or simply guessing when Amazon would only provide ‘shipping weight’ of 1lb for a pair of underwear. So, for the guessing, I would ‘guess’ that a handkerchief would weight in at 1oz, that seems like a fair guess right? No, it is 1.3oz, so when you start guessing like that and assume that your 1.4oz underwear are 1oz and that a shirt should reasonably be 3oz instead of the 4.6oz it is, this can go bad, and all these things add up fast. Sort of like when you take your change into one of those coinstar things, for whatever reason it is always more than you think. 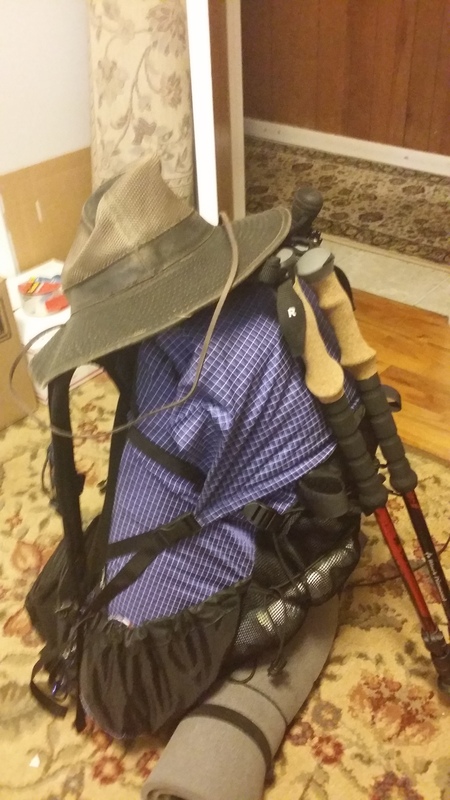 Hiking gear is like that I have found out. My base-weight (the weight of your pack before fuel, food and water) was several pounds heavier than what I thought it was. Last night I went on a gear slash-and-burn thinning out of my gear and getting rid of tons of weight to get me back to the ~15lbs I am comfortable with, I need to do another pass as well. It is kind of humbling realizing that you will not in fact need, want, or probably even use something like a gopro while out there. Anything it can do, my phone can do (except be under water). I don’t need the smartwool long-top I had got as well most likely, I can bounce that forward and pull it out for the sierra when I don’t need to carry as much water and it will be cooler. And ‘water’ really is the issue; in the first sections I need to be concerned with water and have the ‘capacity’ to carry up to six liters of water (which at 2.2lbs per liter is up to 13.2lbs) along with carrying 4-7lbs of dried foods for 3-5 days all in a pack that is rated for max 35lbs. Though, I will typically never need to go over 5 liters of water as the general rule is one liter per three miles and most times you are not over 15 miles from water. With water my total carrying load could be over 35lbs with 15lbs of gear, obviously this goes down rapidly as I eat food and drink water, however you can see the necessity of keeping the weight down and not low-guessing your gear weight. If the pack is overloaded you run risk of damage to the pack or yourself and I neither is good. Also, in sections where I don’t need to carry as much water lighter means faster hiking. You can see why thru-hikers are absolutely obsessed with base-weight. It was a huge improvement last night after the cuts I made when holding the pack. I have several more I am going to make. Including removing the parts of my pack I don’t need like the hydration sleeve and the detachable mesh pocket (2.5oz), and I think I will replace an eVent compression sack (6oz) with a trash-compactor bag (2.5oz) along with some changes to my 8oz medical kit like removing most of the duplicate items and things I you almost never need like the irrigation plunger, that should shave that down to 4oz. Additionally I have rethought my sleeping pad system and ordered a few different ones to try out before leaving including a gossamer gear pad which will drop my pad weight good and keep me below the 15lbs which was my goal and I ‘may’ swap to a 2/3 size inflatable after the desert and the water worries that come with it. This is all part of the fun and I will be updating the gear list in the navigation with the final gear list and final weight. This entry was posted in pct, planning on April 4, 2014 by joeldg.